A local extension of your operation. Our fully equipped 130,000 Square foot facility is centrally located in New Orleans and ready to handle your warehousing & distribution needs. With dock-high and ground access, we stand ready to accept your shipments. We can handle your distribution needs both locally, state-wide and nationally. Centrally located, we deliver for you. Located near Elmwood, the city’s most active industrial area, we are a convenient stop for all of the regional and national freight companies. Our central location allows us easy access to all of south Louisiana and the Mississippi Gulf Coast with minimal travel time. Our fleet of modern delivery trucks with powered lift gates can handle your scheduled delivery requirements as well. As your local distribution point, we work with you to meet the demands of your business. Our climate controlled facility is staffed by professionals with experience in handling sensitive electronics, exhibits, hotel furniture, store fixtures, computers and more. Frequent New Orleans Tradeshow Exhibitor? 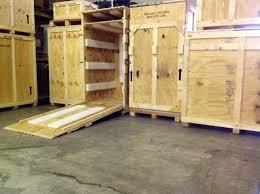 Save shipping cost by letting Maloney store your exhibit in our facility. Our experienced staff will arrange for pickup or you can have it delivered directly to us in advance of your next show. When you are ready for your next set-up, just give us a call and we can have it delivered locally or shipped anywhere in the world. Contact us today for more information on how Maloney can handle your specific warehousing & distribution needs.